Lyme Disease, named after Lyme town in Connecticut where a number of early cases were identified, is a vector-borne illness caused by the Borrelia burgdorferi bacterium. The bacterium is carried and transmitted by the Ixodes tick, which feeds on the blood of humans and animals (including dogs). In the Northern Hemisphere, Lyme Disease is the most prevalent tick-borne disease, affecting up to 3,000 people in the UK every year. With tick season approaching (generally speaking, this is from spring to early autumn), it is important we understand and can recognise the early signs of Lyme Disease to prevent infection in ourselves and our pets. While not every tick will carry the disease, those that have previously fed on the infected blood of another host (human or animal) will be a carrier, able to transmit the disease-causing bacterium to another. If caught early, the disease can be treated with a simple course of antibiotics, although if left untreated, can cause several complications that range in severity. In extreme cases, the heart and central nervous system are affected. Worryingly, not all infected hosts will show symptoms. Perhaps the biggest concern in Lyme affected dogs is the possibility of chronic kidney disease and degeneration which can sometimes arise in animals with an undiagnosed condition. While a bullseye-style rash is symptomatic in humans, dogs do not display a similar sign. Basic indicators to look out for include uncharacteristic or increased lethargy, loss of appetite, stiffness and depression, although recurrent lameness (switching from one leg to another) is usually the biggest clue as to whether your dog has Lyme Disease or not. Although ticks can be found anywhere, in wooded areas, your garden or on your clothes, there are certain areas where they are more prevalent. In these areas (rural and woodland), it is important to take the proper precautions to safeguard you and your dog against ticks and Lyme Disease. If your canine is treated for ticks regularly and/or vaccinated, it stands a better chance of avoiding Lyme infection. However, no preventative measure is 100% effective and you are also at risk of infection, so keep this in mind when considering the best treatment method for your dog. VioVet stocks a range of tick-control treatments, from market-leader Frontline, to Effipro and Fiprospot. We also sell tick removal tools and combs, as well as formulated shampoo. Whether you live in a high-risk area or not, there are ways to reduce the chances of your pets coming into contact with ticks at home, such as ensuring your garden is well fenced to keep your dogs in, whilst keeping wildlife (potential Lyme-carriers) out. Ticks thrive in moist, humid conditions, so making sure dead leaves and other garden debris are cleared away is essential. Long grass can also harbour ticks, so try and keep the lawn maintained if your dog regularly plays outside. If you live in rural areas or near a woodland or field where you tend to walk your dog, it is important to check your dog’s coat (this is best done with a hairdryer), focusing your attention behind its ears, around its head, on its underside, the base of its tail, between its toes, and neck, as soon as you get home. Inspecting your own clothes as well as your dog’s coat and collar is also necessary so that you don’t bring ticks into your home. 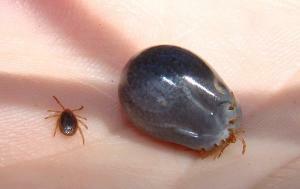 Ticks are difficult to spot, but once engorged (full of blood from having feasted) they are easier to notice and remove. If you happen to see a tick, grasp it close to the skin with a pair of tweezers and pull it smoothly out. Try not to puncture or break the tick as this can lead to infection, just as twisting it out between your thumb and forefinger can by separating the head and the body of the tick, leaving some behind in the skin. Once you have removed a tick, flush it down the toilet or put it into a solution of alcohol to kill the tick before disposing of it. Generally speaking, if a Lyme-carrying tick is removed from the skin within 48 hours, transmission of the disease is less likely, although this is not always the case. Regular inspection of your dog (and yourself, for that matter) will stand you in the best stead of noticing any ticks before they have begun feeding. It also means that if you notice changes in your animal or a rash on your skin, you can seek professional advice quickly. While ticks can be a nuisance and, in extreme cases, hazardous to health, by understanding the cause of Lyme Disease and the measures to try and prevent it, we can worry less about the condition. Checking for ticks regularly, as well as routinely administering tick-control treatments and spot-ons and taking precautions when outdoors in tick-prevalent areas, is the best combined method of defence. For more information on Babesiosis - a malaria-like disease caused by the babesia canis parasite spread by ticks, which has been in the news recently, click here. Want is the best treatment for a Tick bite? In a high proportion of cases, and especially where dogs have been treated with a product such as Frontline (containing fipronil), ticks are killed before they can transmit disease and drop off. These treatments should be applied monthly throughout the year to give the best protection. The O'Tom Tick remover is a useful tool for gently removing ticks if they do not drop off by themselves. Dogs can occasionally have a small local reaction to a tick bite, such as a hard swelling or abscess, and in this instance we would advise taking your dog to the vet. More severe symptoms such as lethargy, lameness and loss of appetite should also be investigated by a vet and if diagnosed as Lyme Disease, are likely to be treated with antibiotics. If your pet requires treatment with prescription medications, it may be worth checking the price on our website, and if you send us a prescription written by your vet, we may be able to save you some money. If it is you or another person who has been bitten and you have developed a bullseye-style rash or any other symptoms, we'd recommend visiting your doctor as soon as possible. I hope this has been helpful please get in touch on [email protected] if I can help further! Tick season can vary enormously. Where I walk, sometimes, in a national trust property well named as Lyme Park ticks are around apart from December and January! My dog contracted a suspected case of lymes disease last year. It meant she had to have a 6 week course of antibiotics. In manifested as lameness and on examination she was very sore in all her joints. She wasn't a happy girl at all. I hope it doesn't come back as it can lie dormant for a while and resurface. I found Frontline totally ineffective against the ticks so now we are trying Practic. Ticks are thriving here in the north of England and as previously stated the horrors are around for 10 out of 12 months of the year.